I must explain that I cannot read the poem above. Few native Japanese readers can, either. I showed it to Watanabe san, the resident scholar in my Japanese go club, and he had no idea what it says. I showed him the cover of the Kido magazine where it came from, and he just scratched his head. 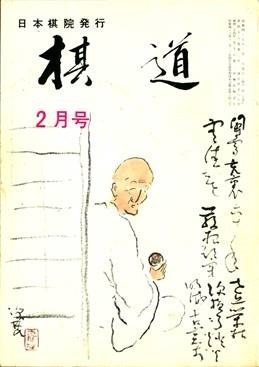 He took the magazine and my rendering of the Chinese characters and contacted the Nihon Ki-in (Japanese Go Association). What did they say? They had no idea what the meaning was either. 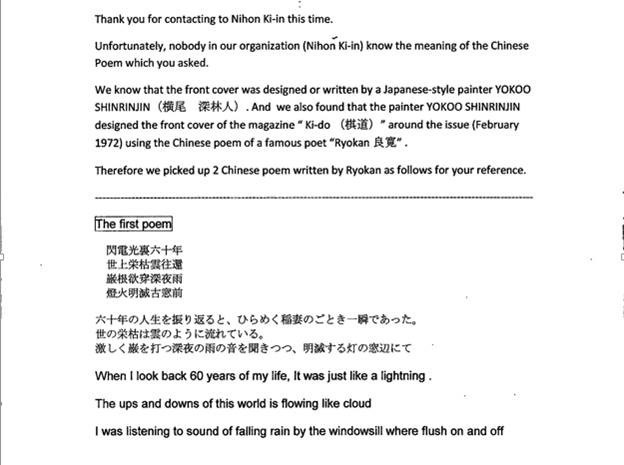 Lest the reader think that I am just passing the buck, I include the note that the Ki-in sent below. Defending his Oza title, already scoring a win in the Honinbo league, voices are raised proclaiming Sakata 9 dan’s "return to good form." In the 10th Annual 10 Dan Title Challenger Final, he defeated his strongest adversary, Rin Meijin, brilliantly taking hold of the right to challenge Hashimoto Utaro 10 Dan of the Kansai Ki-in in the best-of-five title match. This is sure to be the talk of the town in this new year. This year’s fight for the right to challenge for the 10 Dan title has been a two-man show featuring Sakata san and Rin san. First, in the final of the Winners Section, it was Sakata versus Rin. In the end, the Challenger Final [that pits the winner of the Winner Section against the winner of the Loser Section; the 10 Dan tournament gives losers in the Winner Section a second chance by being recycled to the Loser Section; the winner of the Loser Section then fights a playoff game against the winner of the Winner Section] was a game again between Sakata and Rin. At two critical points the same pair met twice. The Winners Section Final was played in August, the middle of summer, the venue being the old Nihon Ki-in facility in Takanawa [district in Tokyo]. Sakata, playing Black, unusually set up a large territorial framework [moyo] and edged out his opponent with a 1/2 point win. The Challenger Final was played four months later, in December. 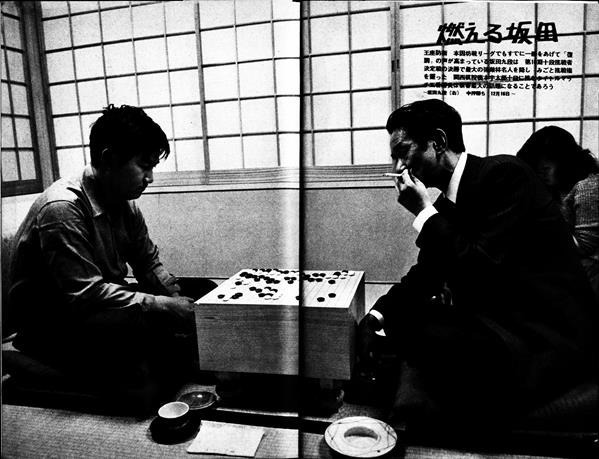 The playing site was the new Nihon Ki-in facility in Ichigaya [district in Tokyo]. This time, Sakata san played White. He rapidly occupied big points around the board, betting the win on the survival [shinogi] of the stones in one corner. That strategy was successful, affording Rin san no latitude to exercise his vaunted gritty play, and winning by resignation. Speaking honestly, before the game my prediction was that, "the chances favor Rin san." I thought that losing the final of the Winner Section would act as a spur to action for Rin san. And in the past, it was Sakata san’s theory that the player who emerges from the Loser Section has the advantage. Besides that, during the period between summer and winter, Rin san had regained the Meijin title, so he must be riding a wave of high spirits. When facing Rin san, Sakata san still suffers from an unbeatable opponent complex. Et cetera, et cetera. However, the end result was an overwhelming victory for Sakata san. Regarding that so-called unbeatable opponent complex towards Rin san, no trace could be detected in Sakata san. "At this point, Sakata san seems to have changed for the better. Like he has experienced a new awakening," was the impression that floated in my mind at the moment when Sakata san won that game. In the Oza title match, he turned away the challenge of Hashimoto Shoji san, and now Sakata san will challenge Hashimoto Utaro san [10 Dan titleholder]. I will watch intently to see whether Sakata san’s resurgence is the real thing or not. 1) In this 10 Dan tournament, besides Sakata san and Rin san, the activity of Kajiwara Takeo san, Handa Dogen san and Ishii Kunio san was unforgettable. 2) With so many jinxes dispelled in this 10 Dan tournament, there is just one jinx that remains in effect. The reigning Meijin has never taken the 10 Dan title. Played on December 15~16, 1971 at the Nihon Ki-in. From Black 1 through White 4, it is the exact same pattern above and below. However, at this stage it cannot be labeled as imitation [mane] go. When Black makes the corner enclosure with 5, White attacks the corner with 6. Then, being pincered by Black 7, my head was full of the joseki that I was thinking about. If White jumps to 1, Black will probably attach with 2 and draw back with 4. The sequence through White 11 may be envisioned, but with the marked Black stone in place, White’s stones will not work as effectively as possible, so this is not attractive. White 1 and 3 is a popular pattern, but after White makes the corner enclosure with 5, should Black attack the corner with a move at A in the figure, it seems that the game is proceeding as imitation go. Regardless of that, it is a match-up of 4 to 1 in terms of influence across the board [Black 1, 5, 7 and the Black stone attacking White’s lower right corner versus White 4], so it is commonsense that White cannot hope for much in that position. I chose to jump to White 8, followed by the attachment of White 10 and descending move of 12. This pattern is considerably thick and strong. Black plays 15 to get momentum to play the move-in-a-row of 17. Should Black simply make the extension to 1 here, White will play 2 and then invade at 4. Since Black has a cutting point at A, it will be impossible to fight well. In response to Black 1, pressing with White 2 and 4 is the clumsiest and poorest way to play. Through 7, Black’s group becomes thoroughly solidified. Therefore, the knight’s move of White is the proper line [suji] to play. When Black answers with the move-in-a-row of 17, White goes back to make the thick and strong move of 18. At the same time, this makes Black 15 into a bad move. When White makes the corner enclosure of 20, this becomes a turning point for Black in the opening. Instead of attacking the corner with Black 21, if Black made the extension at A, I intended to make the large knight’s move corner enclosure of White B. Next, should Black play at C, White defends at D, and Black E is met by White answering at F. This makes the upper side and the right side equivalent options for White to initiate operations in, and this would be a feasible game. 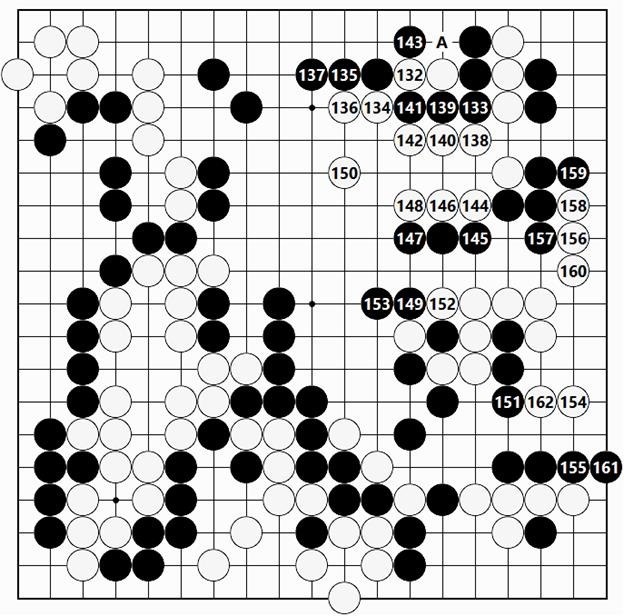 According to the playing style and the judgment of the player, different points will be chosen, but since Black attacks the corner at 21, the character of the game is practically set. The attack and defense of this corner will bear the weight of the fighting, which will be seen in the coming figures. The extension of White 22, just limited to the right side, is an ideal big point. In exchange, I was resigned to dealing some way [sabaki] with whatever happened in the lower left corner. Black plays 23 as a general preparatory measure, then attacks with Black 25. If Black simply attack at 1, White ignores that to play at 2, expanding with the wing formation of extensions on both the right side and the lower side. The attack of Black 3 is dealt with by White bearing down with perseverance by playing 4 through 10 to make life. That is because White cannot be unhappy with the overall board situation. When Black makes the extension of 23, it is natural for White to answer with the move of 24. Defending with White 1 would be safe, but by incurring the checking extension of Black 2, the fact that White’s corner enclosure is open at the edge means that making the one point corner enclosure was a slack play. With 24, White takes what is for the taking, and will deal [sabaki] with the lower left corner in whatever way it must be dealt. In just the progression of a few short moves, this kind of give and take has occurred. Regardless of that, coming at White with the leisurely move of Black 25 was unexpected. I expected Black to close in all the way to 1 in order to attack. In answer to this, I planned to deal with the situation [sabaki] by attaching with White 2 and 4. Should Black reply with 5 and 7, White makes the forcing move at 8, then probably makes the checking extension of White A in the figure. The judgment is that although White can block at A in this diagram to stabilize the group, even if that is omitted, no really threatening attack can be mounted against it. Starting with the attachment at 26, White plays to engineer survival [shinogi] for the group. Something like the diagonal move of White 1 is a textbook example of a bad move. Black slides under with 2 to take away the base, then should White play at 3, Black defends at 4. White is left to just run away. The hane under White’s stone with Black 27 is practically unavoidable. If Black hanes above with 1, White replies at 2, and even though Black can play the atari of 3 as a forcing move, Black has go back to connect at 5. White then makes the fencing-in move at 6, and if Black answers at 7, White makes the diagonal attachment of 8, getting settled quickly and easily. Since Black has let White sprint ahead to take the big points, it would not be good to let this White group get settled easily. Black’s strategy in this game is to somehow attack this White group, and in the process destroy the power of White’s other stones. 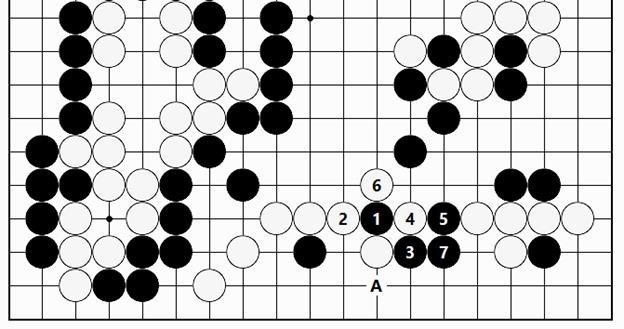 White next attaches against Black’s other stone with 28 in order to deal with the situation [sabaki]. In response to Black 1, extending out with White 2 could also be considered, but when Black extends in with 3, White cannot omit playing at 4 and 6. When Black swoops over White with 7, White can make life by blocking at A, but after doing so, the hane of Black B and the connection of C would be forcing moves, which would be no good. On the other hand, the descending move of White B leaves the gap open at A. and so is meaningless. Also, the hane of White C and connection at B would fix the shape, but solidify Black, which would not be good. It is for that reason that White adopted the strategy of attaching at 28 and extending at 30 to move out above. The diagonal move of Black 31 is played to eliminate White’s eye space as far as possible. Extending in with Black 1 is possible, too, but White blocks at 2, and after playing at 6, the group is practically alive. White wedges between Black’s stones with 32 to fix the shape. With this move, White might attach at 34, but then Black would hane between White’s stones at 38. That would be followed by White 37, the connection of Black 32, White ろ, Black 36 and White 35. At that point Black would surely turn elsewhere to take another good point. White plays 32 anticipating Black 33 with a certain aim in mind. When White blocks at 34, it is natural for Black to play atari at 35, then connect underneath with 37 and 39 while taking White’s eyes. However, White invades at 40, which was none other than White’s aim, and in connection with White’s survival [shinogi], this move is my pride and joy. 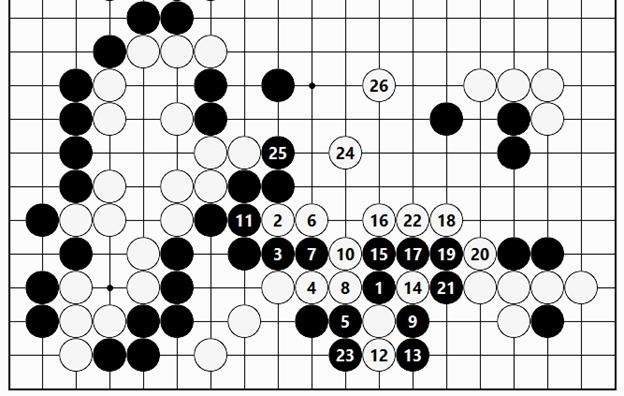 …it was better to make the hanging connection of Black 1 according to Rin Meijin. In a real game it is truly difficult to play a move with this kind of shape. Following White 2, although the moves from Black 3 through 7 are the same, the invasion of Black 8, after White 9, turns out to be unreasonable. Therefore, White will turn to play 8 elsewhere (White A in figure), resulting in a different game. Anyway, the invasion of White 40 is severe. Perhaps Rin san overlooked the possibility of this move being played. The fact is that this move divides Black and makes things very difficult. Of course, this is not the place to simply play White 1 to run away. Black 2 makes good shape to defend the group here. The upshot is that the board situation ends up with White just running away. What should be given attention to here is the tip of White’s group on the upper side with the marked White stone. The question is to what extent this stone can offer support to White’s group in the lower left, and how greatly White is banking on that. It is unavoidable that Black play 41, 43 and 45 to put the shape of the stones here in order. It would be nice for Black if White’s could be caught with Black 1 and 3, but White would push up at 4 and cut at 6. Next, if Black plays at 7, White cuts at 8, and following the sequence through White 12, connecting underneath at A and connecting the ko are equivalent options. Black’s stones end up floating. …it would have allowed Black to attack at 1 here. Now it is too late to play White 2. Black presses upward at the vital point of 3, and should White reply at 4, the hane of Black 5 destroys White’s shape. White ends up with wretched shape. When White plays 46 as a forcing move at the proper time, Black has no alternative but to defend at 47. There is some urgency for Black to utilize the marked stone. How can all the Black stones be put into motion in order to harass White while getting the most out of the position? Black attacks on a large scale with 51. …White 1 could also be considered. Black 2 and 4 would then wall White off, isolating the group, but with the sequence through 19, it lives. …Black 1 is another thought, but starting with White 2 and 4, the sequence through White 12 makes life with robust shape. In the end, Black considered the left side as the most important area to preserve, and therefore chose play 59 and 61. No doubt, this is the standard outcome to expect here. Now there is a lull in the action. Black plays 63 and the following moves to start activity against White’s position in the lower right corner. In the local context, this is quite normal, but since White is solidified, the moves are questionable. Black seals White in with 75 and 81, but since in return White takes profit with 82 this is problematical. That is because playing as in the game loses the opportunity to take profit with Black 1 while attacking. …the attachment of Black 1 is tesuji. Should White answer at 2, Black continues with 3 and connects at 5. White 6 is met by Black 7, making an eye, so it is a good point. Then, even if White attacks with 8, Black plays 9 and the following, running away with 17 and 19. In response to White 18, Black 19 is a strange move, but it keeps all of Black’s stones connected. Black and are forcing moves that mean that Black has nothing to worry about concerning these stones. In so saying, it now becomes obvious why the point of Black 7 is such an important vital point. …when Black attaches at 1, White plays at 2 first, robbing Black of the vital point. This is an important order of moves that White must not miss putting in place. By doing this, the game does not go well for Black. Should Black push through at 3, White pushes through at 4, and then Black 5 is met by White drawing back at 6. The progression of moves after that shown here are nothing more than a conjecture, but in the end White plays 24 and 26, finishing up by completely surrounding Black’s stones on the right side. In the final analysis, White 1 can only be answered by the connection of Black 2. This would be followed by White 3 through 7, and then attaching with White 9 and drawing back at 11 would be standard. Black is thin and weak all across the board, and in bad straits. The conclusion to be drawn is that it is impossible for Black to run away, and so there is nothing to be done but to develop with Black 83. White then captures Black’s stone cleanly with 84. There is little potential [aji] for trouble, which is big, and unless White fixes the shape here like this, it will be impossible to play freely later. When Black links the stones up with 85, White fixes the shape with 86. This makes White A a forcing move that has to be answered, so this White group is unquestionably alive. White moves out at 88, and then Black 89 is met by the tesuji of the wedging-in hane of White 90. White launches a counterattack by striking at the thinness of Black’s stones. One way or another, I believed that the outlook in the game was promising for me. Black plays atari at 91, then adopts the makeshift measure of making the hanging connection of Black 93, but the shape is rickety, thin and weak. When White cuts at 94, Black does not have the leeway to extend at A. That means that Black will have a hard time of overcoming the unfavorable outlook in the game. Black fixes the shape with good potential [aji] with 95, and although in exchange White is alive with 96, that cannot be helped. Black then tries for a counterattack with the attachment of 97. In response to this, fighting spirit induces White to hane strongly up over Black’s stone at 98. If White answers Black 1 by taking the large part with 2, contrary to expectations a disappointing result will ensue. It incurs Black’s resolute block at 3, and then if White plays atari at 4, Black answers with atari at 5, followed by the tenacious connection of Black 7. When this shape is reached, Black ends up being given the option of hanging tough with the hane at A for an all-or-nothing ko to bank the game on, so White will feel apprehensive, too. In response to the hane of White 98, the crosscut of Black 99 is tesuji. 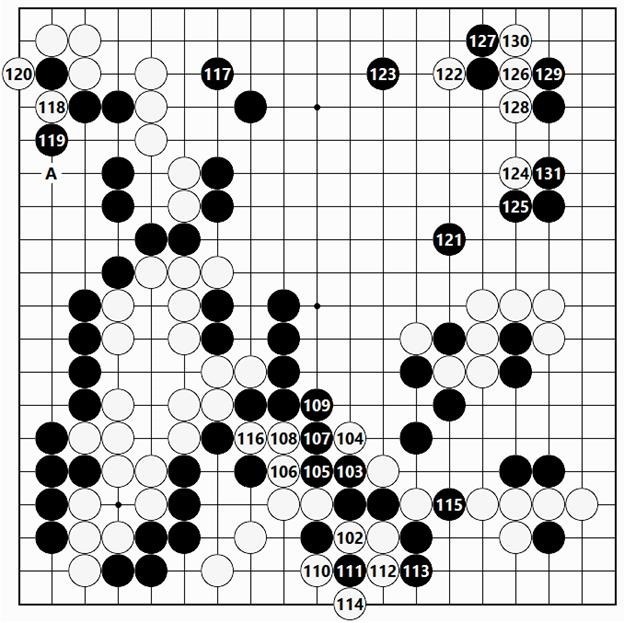 However, the atari of White 100 is met by Black extending at 101, in keeping with what the Meijin had read out, but here an unforeseen momentum of the play led to the engineering of a huge swap. White 2 and 4 and the following moves comprise an unbranched path. The play through Black 9 is unavoidable. Then, if Black uses the move at 11 to connect at 16, the sequence up to that point does not make sense, so it is natural for the swap of Black 15 for White 16 to take place. …the atari of White 1 is bad. Following lack 2, should White play 3 elsewhere, Black 4 and the sequence through 14 results in a ko. This is the potential [aji] that would end up remaining here. Although "momentum" is the term used, at the time I did not think that White was badly off. Black 17 is played in exchange for the capture of White 18, which is a terrible loss (since White A is left). However, it sets up Black 21, surrounding territory on a large scale. This is Black’s final all-or-nothing attempt to win the game. Playing the standard move of Black 1 to surround territory would be answered by the attachment of White 2 to put the potential [aji] for variations in the position. Then White plays the standard neutralizing move of 4, and Black will absolutely fall short. When White attaches at 22, Black attacks at 23. The board position is such that if Black does not kill every White stone within this area, it will be impossible to get back into the game. However, White plays at 24 and attaches at 26, and I was confident of surviving [shinogi]. …Black 1 would be safe and sound. However, with this, White would play the moves at 2 through 22, and Black would have no chance for success. …Black can attack with the moves of 1 and 3, but here, too, White plays 2 through the attachment of 8, achieving survival [shinogi] shape. White 50 sets everything in order. Black 51 and the following moves press in against the lower right side, but White lives there with 62, and White has nothing to worry about regarding the corner, so there was nothing for Black to do but to resign. This was one of Rin Meijin’s rare poorly played game. The stumble on the lower side was fatal. 162 moves. White wins by resignation. I just love these ‘old’ games with commentaries. Also the little stories of them or about Japan.